Having red hair puts you in an exclusive group of people of 2% the people in the world. Yup, only approximately 140 million people worldwide are natural redheads. Of course, not all of them have short red hair, some grow it out so those of you with a short red style are in a very small exclusive group. When it comes to hairstyles, redheads are, without a doubt, the most envied amongst women of all ages – and all for the right reasons too. Redheaded women not only demand attention at first glance but also look extremely gorgeous regardless of various other factors that women with other hair colors often need to take into consideration when styling their hair. For instance, face shape and skin tone, as well as the length of your hair, do not matter much if you have red colored hair because the alluring shade is likely to look stunning no matter what. Plus, you can style it in versatile ways by going for a feathered cut, a layered cut, different types of bangs or several other styles. But rest assured you will rock them all. Women with naturally red hair usually love to flaunt this gift by letting their hair grow all the way down the back. However, not everyone loves long hair. If you prefer shoulder-length hair or like to keep your hair even shorter and are looking for some ideas on great short red hairstyles for women, then you have come to the right place. Whether you are a born redhead or someone who’s so mesmerized with the color that you plan to dye your hair to a similar shade, check out our gallery featuring various celebrities with short red hair and gain some inspiration to up your hairstyling game. Christina Hendricks is one of the top Hollywood charmers who is a natural redhead. So if you are looking for great short hairstyles for women, look no further than this beautiful redhead. A short haircut with loose, wispy outward curls coupled with a long side-swept bang will surely turn heads wherever you go. This short red hairstyle for women is best for all those free-spirited ladies who want to reflect the same liveliness in their physical appearance as well. The hairstyle comes close to a pixie cut but has rather long, tousled strands that look impressive despite the messy waves. Alicia Witt sports a great short red hairstyle for women by going for a feathered cut coupled with eye-skimming, airy separated bangs. Slightly curl the ends into outward whirls for a fancier finish. This short red hairstyle for women is oozing beauty and style. With hair pulled up in a neat bun, Isla Fisher lets sleek and silky bangs adore her face to evoke an aura of grace and elegance. Take notes from Bella Thorne on how to make an attractive red hairstyle for women. Her short red hair have been formed into a lose side bun while she has gone for choppy bangs that completely cover the forehead to look truly spectacular. This short red hairstyle for women features a chin-length cut. Notice how Debby Ryan manages to let the beauty of red hair shine even in a short length by sporting thick bangs at the front. A prim and proper haircut eliminates the need for further styling and this short red hairstyle for women illustrates this statement perfectly. A wispy bob with a pointed side-swept bang is bound to look extraordinary. Love the ‘90s? Feel like going retro? If you answered yes, then this bold and elaborate but superb hairstyle for women with short red hair is the ultimate style to consider. However, note that you will definitely need some hairspray to keep those waves blown back dramatically. Here we see the undeclared redhead queen of Hollywood wearing her hair down in a tousled manner. Short baby bangs that line the forehead are another great way to let the catptivating color radiate. If you have or love a wavy texture, then take a good look at this easy-going red hairstyle for women. 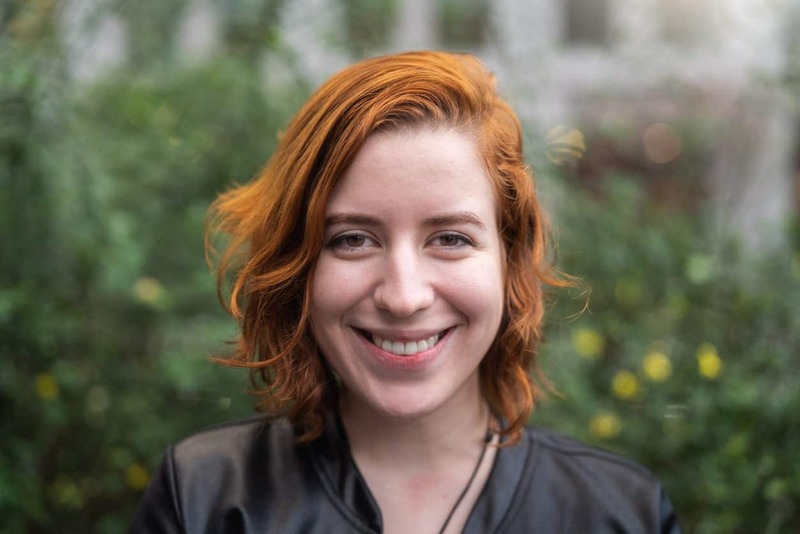 Considering a really short red hairstyle for women? Then a rocker pixie might just be the ideal style for you. Sometimes even a single hairclip and loose, bouncy curls can make a hairstyle truly chic for women with short red hair. This wispy-wavy look combined with a tapered bob is one of our favorite hairstyle for women with short red hair that Emma Stone has ever rocked. Alyson Hannigan perfectly demonstrates how wonderful having red hair can be because a hairstyle as simple as this can look really great. If you want short red hair that doesn’t require much styling, then go for a chin-length cut and wear your hair down to look effortlessly stylish. Here we see Alyson sporting a different but equally fascinating hairstyle with layered locks that have been chopped at shoulder level. This is a genius style to adopt if you have changed your mind about short red hair and are letting it grow out instead. Redheads are viewed as lively and energetic people probably because their hair color gives off such vibes. And in case you don’t believe so, you will surely agree after looking at Susan Sarandon’s vivacious hairstyle for short red hair. Whether you are still in your prime or not, age doesn’t matter when you make a hairstyle for short red hair that is as classy as this one. A center-part at the front coupled with slightly backcombed strands behind it and a layered cut at the sides is guaranteed to make anyone look mod and stylish. For those days when you don’t feel like putting much effort into styling your hair, simply pull your hair back in a low bun and to balance the otherwise plain look, wear some attention-grabbing accessories like this heavily embellished necklace. Messy buns might not be possible for women with short red hair. 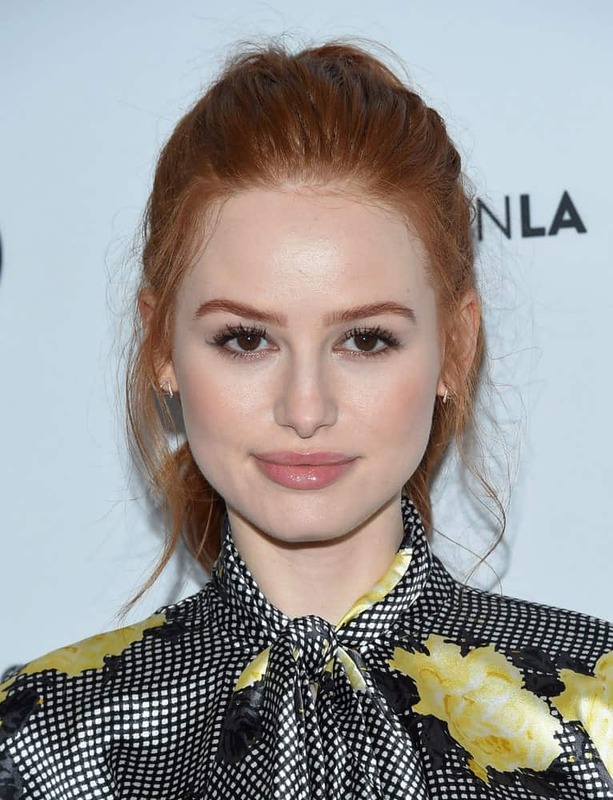 But if you want that casual, and laid-back look, then you can slip your hair back as Madelaine Petsch has done here. Of course, the relaxed look is incomplete without some fly-aways. 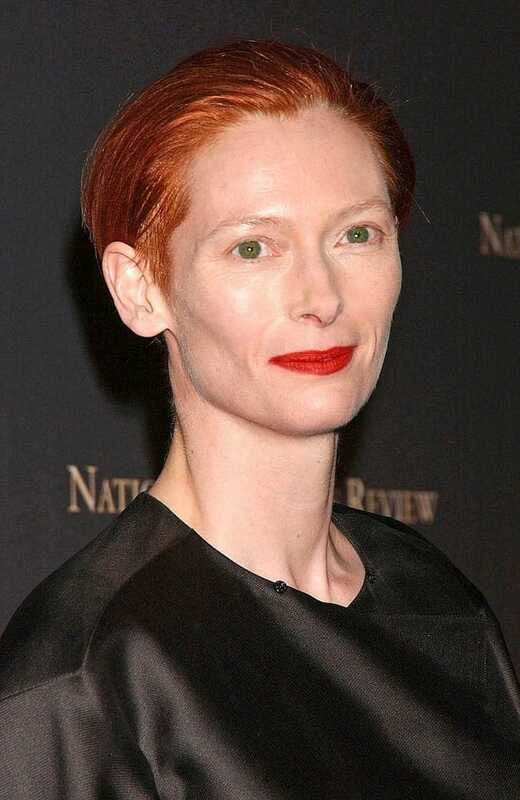 This might not be suited for everyone, but if you feel like chopping all those long locks off, then you can gain some inspiration from Tilda Swinton. If you feel like dying your red hair a tinge darker or you already have dark hair and wish to get some red highlights, then Jillian Reed’s hairstyle provides a guideline on how best to go about it. With deep hazelnut-red hair color, Kristen Wiig shows how deep side-bangs and a subtle feather cut make a good short red hairstyle for women. A voluminous look from the weighty bangs is usually best suited for women who have a thin face profile like her. It might look plain at a first glance, but this hairstyle for women with red hair is a timeless one that will never go out of style. Be it a formal or a casual event, bouncy curls like these will always make you look effortlessly elegant. Whether it’s a wedding or a weekend party, this imposing hairstyle for women with short red hair will definitely wow all the guests present. Note that the key to balance (and also further accentuate) the blown-back upward hairdo is to sport some long and pointy earrings. 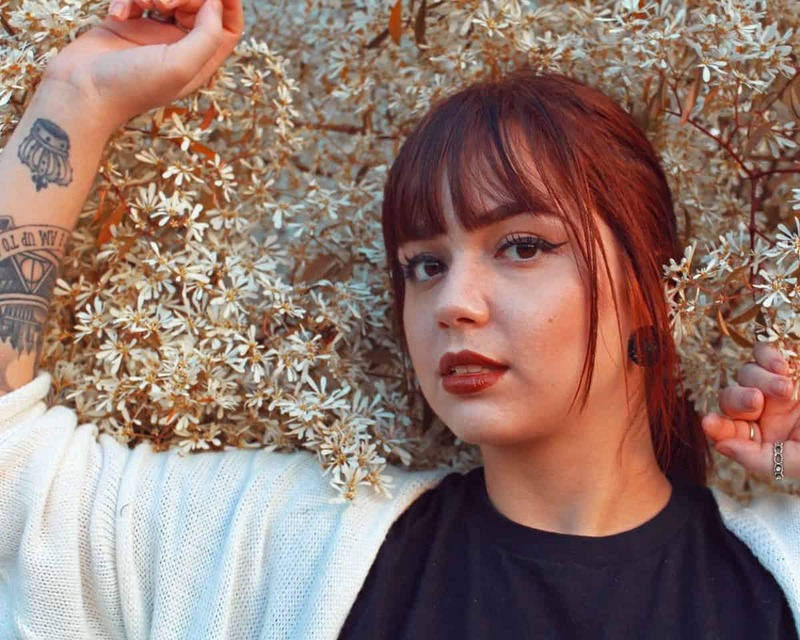 Whether you have hair that is naturally as red as this or you have dyed them this vibrant shade, the best hairstyle for women with short red hair, in this case, is an angled bob with blunt bangs. A hairstyle is as minimalistic as this lets the dazzling red tone take center stage. Red hair, short length, fine hair. If you fit all the three categories, then this simple and trouble-free hairstyle for women with short red hair will suit you well. You might not have a daredevil act going on but if you are a strong-headed woman who embraces the challenges of life boldly and confidently or just someone who loves being impulsive every now and then, try going for a rocker pixie. You will surely love the new look. Like we mentioned earlier, redheads need not worry about several ‘beauty’ aspects since they look stunning no matter what. But if you are still conscious about having a round face profile, then a deep angular bob like this can ease your worries. This is because the slant strands that are longer at the front give a sharp and pointy look, thereby balancing a fuller face. Short hair shouldn’t stop you from going for such coily hairstyle. Besides, it will also give you a youthful, playful look. Braids and bunds are too mainstream. Go for this unique hairstyle for women with short red hair instead to turn heads and drop jaws at a wedding party. This short red hairstyle for women is simple yet alluring because it has details enhanced in it with the wavy texture and a subtle step cut.